﻿There are a number of variables that affect the performance of the reining horse. Breeding, conformation, mental attitude, footing, rider’s skill level and shoeing all have an impact. The best bred reiners have a natural ability for good lateral movement and sliding stops. Their conformation includes strong hind quarters and straight hind limbs (viewed from front or hind), with powerful shoulders to enhance turning ability. 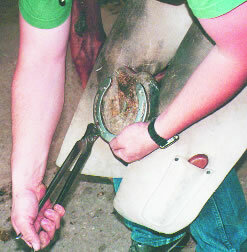 As a rule, the farrier cannot control any of the variables except the shoeing. 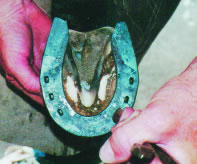 Foot prep is no different on the reiner than any other performance horse. 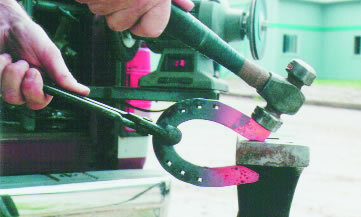 Previous articles in The Natural Angle have stressed the importance of trimming the foot flat, placing a level shoe on the foot and providing good lateral support- putting the frog in the center of the shoe. 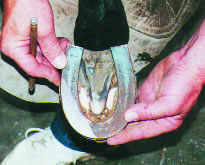 The difference for the reiner is in the type and positioning of the shoe. I will warn you here, never trim the foot out of balance to change the direction of the slide. To get the best results from the reining horse you need the slide to be straight, with the least amount of resistance possible. 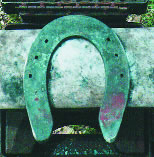 A horse with good conformation and a hoof that is straight should be shod with the toe and heels of the shoe in line with the direction of the foot. Watch the horse slide. If his hind feet are under him too far, lengthen the heels of the shoes. If he is not under himself enough, shorten the heels. I never turn the heels up as I believe this takes from the support needed for the slide. The more difficult challenge comes when you have the horse that turns out, causing the slide to go outward. A horse that is sliding outward reduces the length of the slide and puts additional stress on the muscle structure. In clinics, I often ask everyone to think about snow skiing. If your skis are angled out, you will very quickly be stretched to an uncomfortable position and your ability to go forward is decreased. To continue forward you have to continually step back in under yourself. The same thing happens in the slide of the reiner. 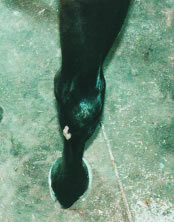 I try to resolve this problem with shoe position rather than changing hoof balance. Do not lower the outside to change the direction of the slide. The “quarter turn” is the term used for this corrective shoe placement. Whenever you quarter turn a shoe you will find it necessary to either punch blanks or repunch shoes to line up to the white line and the widest part of the foot. The photos in this article illustrate the steps of punching, fitting and nailing the quarter turned shoe made from a blank. Begin by selecting a blank length that you feel will work. 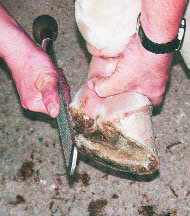 Considering the evaluation of the hoof direction (done from behind the horse), position the shoe to get the directional alignment you need and mark the widest point and the toe nails. Using these reference points, center punch your marks (considering the white line) for nail placement. You will be punching the medial (inside) branch deeper. Punch and drift the shoes and when pritcheling, be sure to angle more at the toe and less as you go back to the heel nail. You should hammer finish the heels to the approximate taper you need to allow the foot to clean (following lines of frog). This can be done before, during or after the punching. 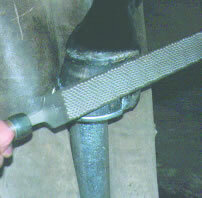 If I know the shoe needs to be opened, I often use the tongs as a spreader while I have heat in the toe. Check your fit and make any adjustments necessary. Once you are satisfied with the fit, use a belt sander or grinder to dress the heels, edges and put the desired roll on the toe. The footing will generally determine how much roll you need. If the footing is good, with a sandy top and a hard flat base, you need less roll. If the base is uneven and/or there is less sand on top you will need more roll to reduce the resistance. I always have some degree of roll on the toe. You can now nail the finished shoe in the quarter turn position. Be sure you have placed the frog in the center of the shoe to provide the maximum medial/lateral support. The final step after clinching is to rasp the nail heads flush with the shoe. The “quarter turn” should help the horse to slide straighter, enhancing performance and reducing the stress on muscles and joints. Using the position of the shoe to change direction will help avoid problems that trimming off balance can create. (﻿7.) Hammer taper into heels. (8.) Tongs can be useful to open shoe. (9.) Check fit, note turn of shoe. (10.) Note deeper position of inside nail holes. (11.) Position shoe in turned position with frog in center. (12.) After nailing and clinching rasp nail heads flush. (13.) Lateral view showing heel length (note missing wall). (14.) From rear you can see shoe is centered to limb.